Beach front paradise; luxury villa -affordable rate. Perfect, relaxing escape! Property 4: Beach front paradise; luxury villa -affordable rate. Perfect, relaxing escape! CASA CHULA-OCEANFRONT. NEW PRICING: 1 PRICE/MAX 8 PEOPLE ! Property 7: CASA CHULA-OCEANFRONT. NEW PRICING: 1 PRICE/MAX 8 PEOPLE ! 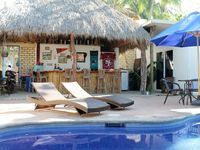 Property 10: Beachfront Puerto Escondido Villa w/ Rooftop Pool! Property 12: Dream-Like Tranquility In This Beachfront Home. 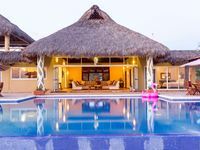 Pto Escondido, best high class Villa on the beach, private Thai Style. Property 17: Pto Escondido, best high class Villa on the beach, private Thai Style. The property was beautiful and well-appointed, and sat on a broad stretch of beach with seldom another person in sight. The property was always clean, laundry was done when hampers were filled, and everyone worked with a smile. All of the meals and beverages were delicious, the staff was pleasant and accommodating to every need. Communications due to my limited Spanish and the limited English of most of the staff were overcome with patience and good humor. Scott dropped by on several occasions to make certain that every need was addressed. The only real negative was that mosquitoes descended at dinner time, so a good repellent is mandatory then. The city is pleasant, as were the people. I look forward to returning to Casa Doris and exploring more of Oaxaca. Scott and his wife, Sara, were most accommodating. They offered suggestions for beaches, restaurants and nightlife, as well as how to get around the area. When I booked the property, the amenities included air conditioning, an important factor in choosing this property. When we arrived, we were disappointed to find out that there was no air conditioning, just ceiling fans. The owners live on the property, which was a bit awkward. Many good restaurants as well as a few markets were within walking distance. Taxis were cheap and plentiful.